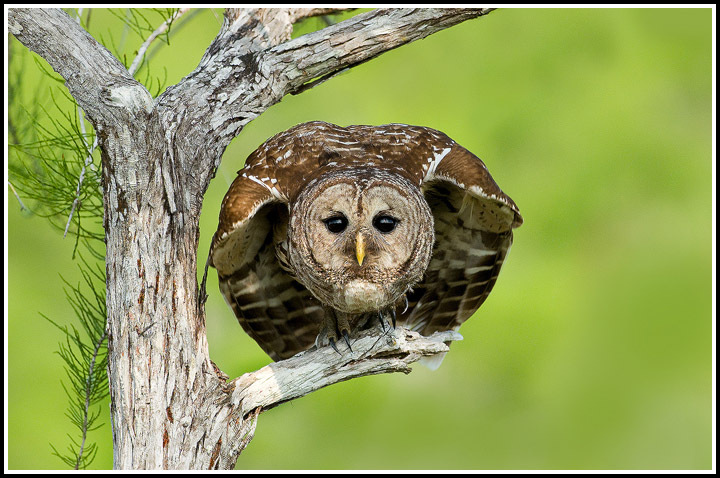 Here’s another from my great time with the Barred Owls! Sorry for the lack of updates. 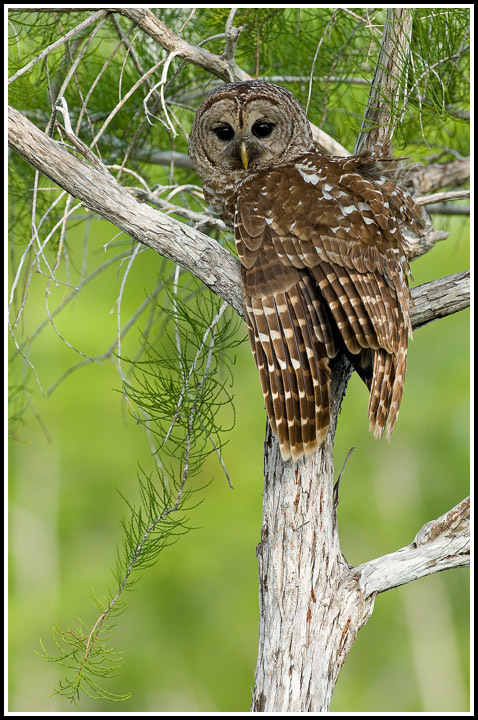 A lot has happened since my last post on here, including but not limited to: Burrowing Owls, Barred Owls, awesome Roseate Spoonbills, and unfortunately, the death of a D300! I’m going to keep this post short and sweet because I’m feeling rather lazy and in a hurry. Anyway, here’s the camera story. I was out photographing on the north beach lagoon in Fort DeSoto State Park. The shutter mechanism on my D300 went nuts and somehow broke while I was using it, which was horrible within itself. Obviously I wasn’t happy with that, and I began to walk back to the car to grab my backup body. While I was walking back, I tripped and fell, sending my D300 to its watery demise. I guess it happens to everybody at some point… Right? 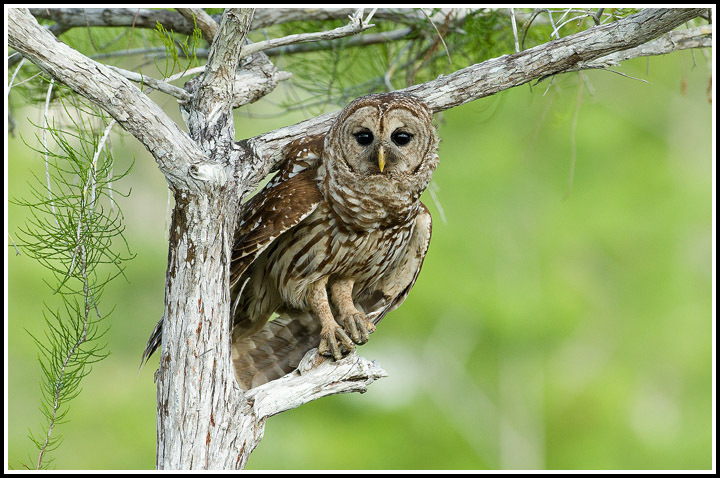 Here are two images I took while going after a pair of Barred Owls in Everglades National Park. I have Paul Marcellini to thank for telling me about the location. As luck would have it, he and Rick Gomez showed up and we had a good ol’ time trudging through the swamp. Oh yeah, and Happy Easter if you celebrate it. Florida is awesome so far. 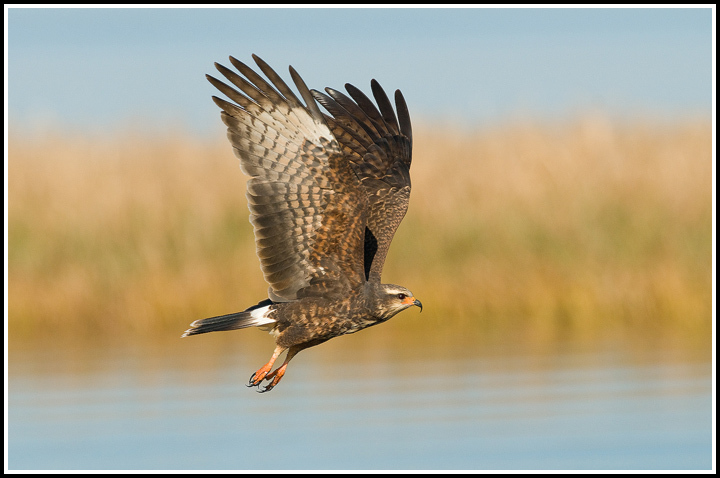 Here’s an image of a female Snail Kite from Lake Kissimmee. This bird is endangered in Florida and I’ve been told biologists have concluded that there are under 900 of them left. Anyhow, I had a blast photographing them, and I hope to get back again before I leave in search of a nice looking male. Anyhow, this fine lady had just finished consuming an Apple Snail, and just took off from her perch to go find another one. 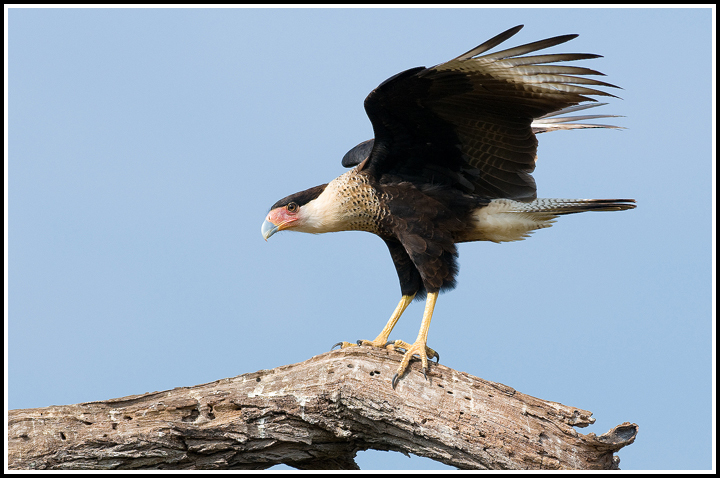 This was one of many Crested Caracara from the Rio Grande Valley, or RGV. No wonder this place is a birding and bird photography hotspot. 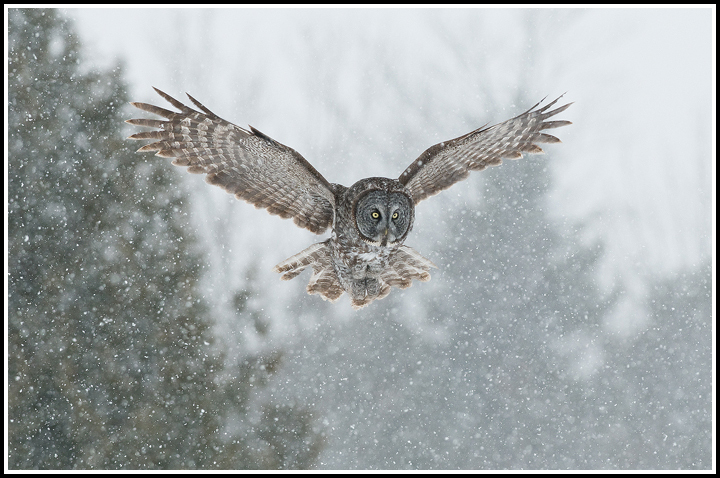 Here’s another one of the Great Gray Owl I photographed in Ottawa. Once it landed on it’s prey, it would sit there for a few minutes, and would allow us to get pretty close. Before re-positioning myself to shoot the bird taking off back to it’s perch, I would try to capture a few static shots. For this particular shot, I laid down on my stomach for a super-low angle in order to show the falling snow against the darker background. Anyway… Here’s my quick story. 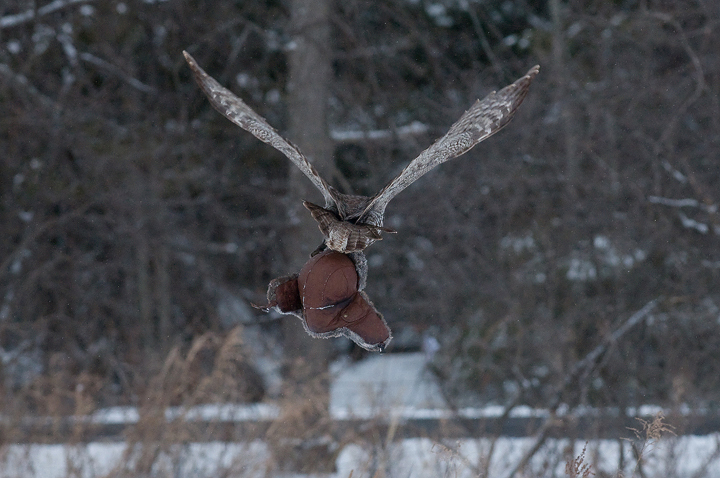 My super-warm leather and fur mad bomber hat was getting in the way a bit while trying to get flight shots of the owl. I casually tossed it a few feet behind me, and the owl instantly swooped down, snatched it, and flew off to the woods. He didn’t come out for the next fifteen or twenty minutes. Who knows what he did with my hat. Anyway, this image should give you an idea for what I saw as I bid farewell to my hat. Sorry for the lack of recent updates. We’ve been really busy between the birds and driving. Amherst Island was a bit of a bust, but we’ve had great luck around Ottawa and Algonquin Provincial Park. 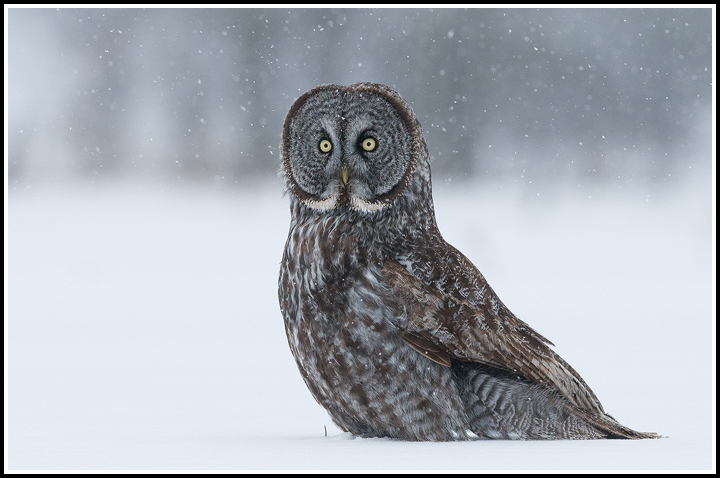 I have tons to share over the next few days, but here’s a shot of a Great Gray Owl in the snow. I now love shooting birds in flight when it’s snowing. 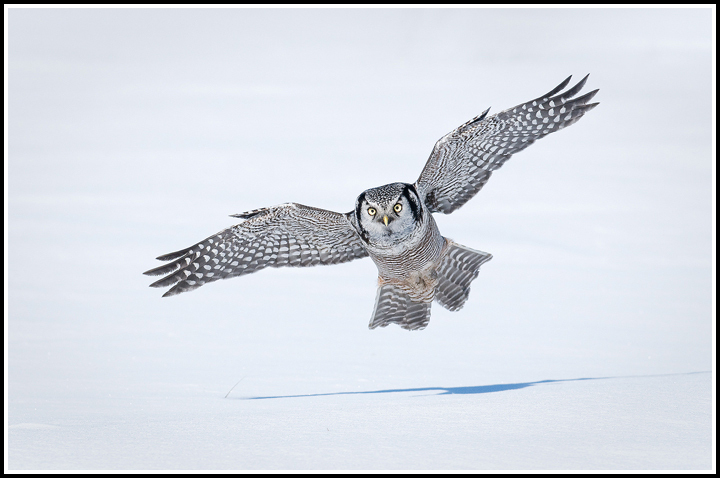 Also, I have an interesting story about this owl which I will share with you all in my next post.